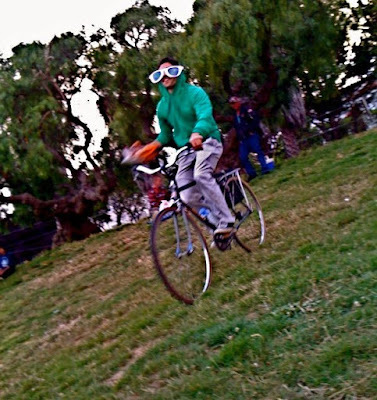 This is what happens when you let friends ride your bike in Dolores Park in San Francisco on the 4th of July. Now what does this have to do with Flint? The bike that Mr. Big Glasses is riding — while descending a steep incline and holding a helmet in one hand — is the Schwinn Le Tour Luxe my mom bought for me in the spring of 1984 back in Flint. It's covered a lot of miles in the Vehicle City. It's still rolling along and even managed to survive this test run. Warning: Professional Tecate stunt rider. Do not attempt this maneuver. 1984 eh? That's the year that my last bike got stolen in Flint. A friend of mine and I rode all around town that night, as it was the night that the Journal put on their (first and only) Easter Egg hunt. We didn't find any, of course, as half the town was camped out at the "hiding places". I was exhausted when I got home around 5 AM, and I neglected to lock up the bike... Of course, once I awoke, it had vanished. That was Stolen Bike #13 for me. Total number of bikes stolen from myself and family members in Flint between 1971 and 1990 probably clocks in around 20. I got my Drivers License later that year, so I never bothered with any more bikes. 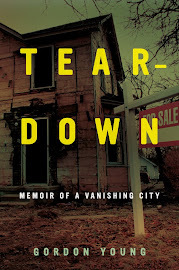 But I used to ride my bike from my East Village house out to Playland way out on S. Dort regularly, visit a friend of mine who lived in Richfield Trailer Park. I also biked out to Davison a few times. Now that I think about it, I probably traveled more miles in Flint by bike than I ever did by car!